We are about at the half way mark for most Colorado growers. At about this time the pumpkins will have put on about 2/3 of their total weight that they will have when they go to the scale. 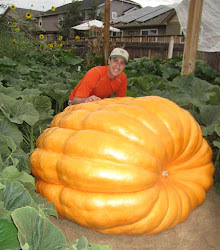 Some lucky growers may have pumpkins that put on even more weight than that. No big pumpkins will come out of my patch this year. A combination of factors, both in and out of my control, have limited my pumpkins potential. You can't do much about a curios dog that decides it will take a bite out of a female flower that is primed to grow on two separate occasions. For the first quarter of the season I think I did things about as well as I have any season in the past. Then a couple of miss-steps, without question, will have caused me a couple of hundred pounds on the scale at the end of the season. A busy work and summer schedule opened the door to these mishaps. Something to learn from for future years. I'm still scratching my head some on the 1985 pumpkin. I'm not sure I fully understand what happened with it. I know that 4 days of poor watering messed up that pumpkin in some way, but I'm not sure why it was so affected and I suspect there is still something going on with that plant that I haven't fully discovered yet. The 282 pumpkin is growing average. Nothing special with it so far. The plant itself doesn't seem to have that extra gear to really drive it along, but it is young so will have to see what happens two weeks from now. I keep taking care of the plants like they are champs however. Gave the plants some fish & seaweed with RAW Full Up and RAW Yucca included in the foliar application.